Finally, a customer decided to get a frame with two woods! 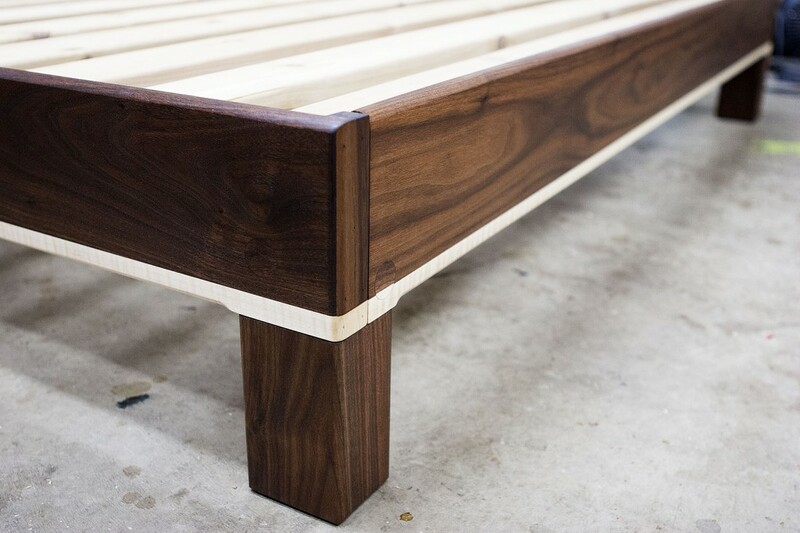 This is a queen bed frame with 15 slats, made of black walnut with a strip of curly maple running along the bottom. The finish is pure (no thinner) tung oil, sanded smooth as glass. Careful observers will notice that since the bolt holes on the short rails landed on the dual-wood portion of the frame, the plugs for them are also made of both woods. In addition, this is the first frame to have the corners of the long rails rounded off, and it’s also the first frame where the screws for the center support aren’t visible from the outside (they’re driven in from the back). Take a look at the hardwood frames page for more photos. ← Bolts and plugs have arrived!